All transactions are safe and secure with a reliable history in online purchasing behind each of our associates. 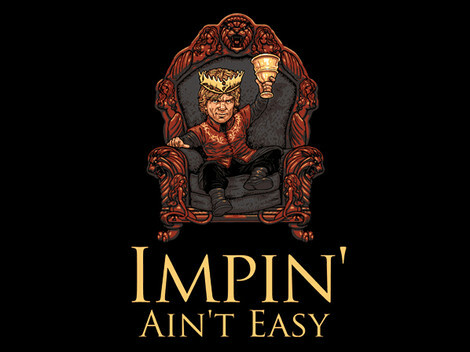 Buy the Tyrion Impin' Ain't Easy t-shirt to own Game of Thrones clothing and merchandise. If there's one thing we know from Tyrion Lannister, it's that being a little person in the cutthroat lands of Westeros isn't easy, as this design indicates. The "Imp" as he is often called, compensates by way of intelligence for what he lacks in stature. As the Hand of the King, his ingenious strategy to use an explosive chemical called wildfire to defend King's Landing allows the Lannisters to maintain control of the Throne. This will easily become one of your favorite Game of Thrones t-shirts as you represent the show's most formidable character. In addition to the Tyrion Impin' Ain't Easy tee above, browse the Game of Thrones Clothing Gallery for more apparel like men's and women's clothes, kids shirts or hoodies.